The Fourth Quarter of 2018 proves to be another record shattering year for the small business mergers & acquisitions market. Buyers are confident in the economy and their capability to take their finances into their own hands through business ownership and have found the opportunities more and more accessible. Sellers also exhibit confidence and optimism towards the market for its ability to provide them a valuable return. Introduction. For the third year in a row, a record number of small businesses changed hands, 10,312 were reported sold, in fact, according to BizBuySell. This is the highest number of businesses that has exchanged hands since the listing giant, BizBuySell, started collecting data in 2007. This continued high level of activity has stemmed from an amalgamation of variables coming from both the buy and sell side of the transaction story. From the seller’s perspective some business owners want to get away from rising health care costs and growing minimum wage, while even more baby boomers are preparing for retirement, and of course the high valuations make a sale very attractive. US culture as a whole has been very small business focused over the last ten years, shedding more light on the opportunity of business ownership and opening pathways to acheive it. 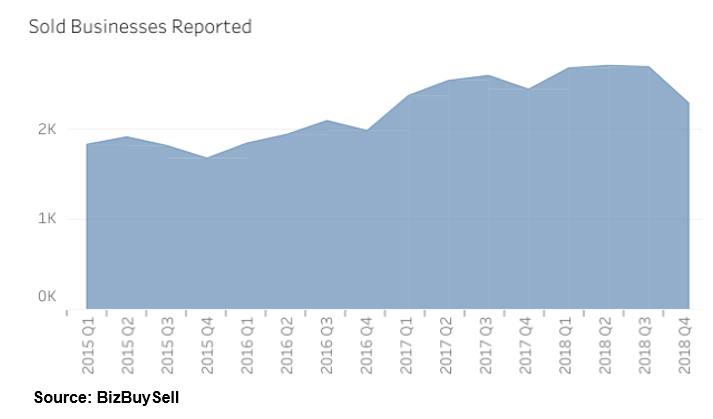 2,288 small businesses traded in Q4 2018. Q4 2018 hit a median revenue of $519,287, a decrease from Q3 2018’s $530,995. Median cash flow reached $119,382, a minor increase from Q3 2018’s $116,229. Small businesses sold for a median price of $230,000, same as this time last year. Click here to receive our full quarterly market insight report straight to your inbox. If you have questions about our quarterly market insight report or are thinking about listing your business for sale to take advantage of this great market, we invite you to schedule a complimentary consultation today.